So no one has actually ever asked what tools I bring with me when I go junkyard diving, but I wanted to share my experience in putting together a reasonably priced set of tools that I can trust to get the job done. My target budget was around $100 for a toolkit that would do 90% of the parts pulling jobs I would need to do. If I'm going to for something heavy duty (like an engine or axle) I will plan to bring additional specialty tools for that job. I also wanted these tools to be inexpensive enough that if I lost one or left one at a yard I wouldn't be frustrated. The trick here is buying tools that are a high enough quality that they are accurately made and won't damage the part or the fasteners in the process. This is especially true for wrenches and sockets. This is probably the one area I spent most of my budget. I didn't want to spend Craftsman amounts of money but I didn't want to buy Harbor Freight either. 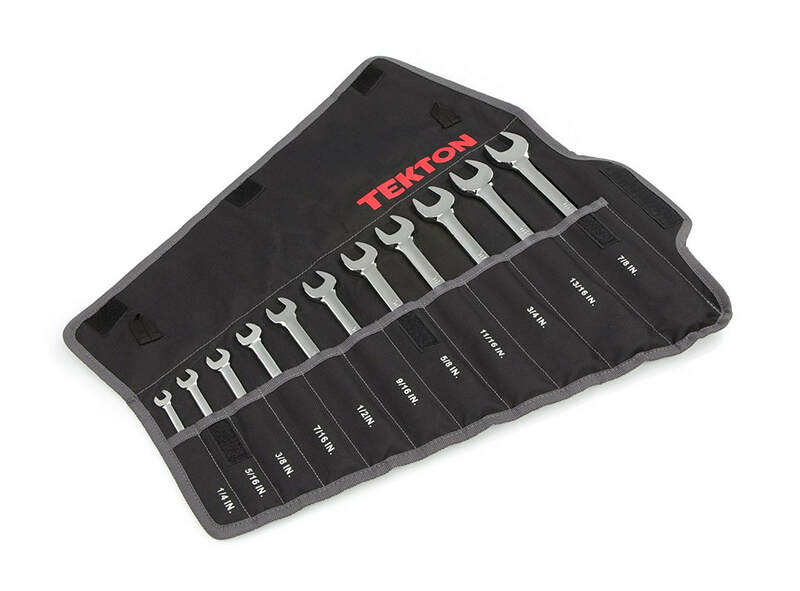 I compromised and bought combination wrench sets from a brand called Tekton. You can purchase these sets on Amazon and they come in two different tool holder styles. One tool holder is a plastic molded rack, the other is a roll-up cloth pouch with hook and loop (Velcro) closure. There is no real difference in price either way so I opted for the cloth pouch as I figure it will hold up better and pack nicer into a tool box. Both sets are 11-piece with (almost) no skipped sizes. When I ordered, both sets were selling for around $33. So that's already $66 of my budget. 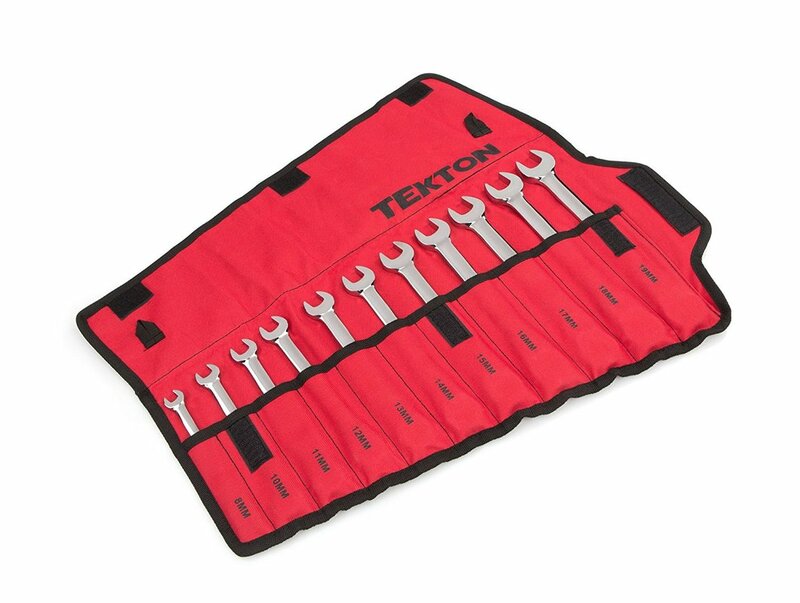 Here is the Metric set, Tekton cat# WRN03389. It includes the following sizes: 8mm, 10mm, 11mm, 12mm, 13mm, 14mm, 15mm, 16mm, 17mm, 18mm and 19mm. ​It does skip 9mm, but I don't think I have ever encountered a fastener with a 9mm hex head. And here is the SAE/Inch set, Tekton cat# WRN03289. It includes the following sizes: 1/4in, 5/16in, 3/8in, 7/16in, 1/2in, 9/16in, 5/8in, 11/16in, 3/4in, 13/16in and 7/8in. I expected to spend a lot more money here but I won't complain. The funny thing is that I ended up buying Craftsman tools to fulfill this tool need. I only wanted 3/8 drive sockets as this is a good compromise between physical size and torque capacity. I also only wanted 6-point sockets. 6-point sockets allow for more torque application without the chance of rounding off bolt heads. 12-point sockets should never be used for breaking loose hex-head bolts (especially those in a junkyard). For socket sets I found that Sears/Craftsman had the best deal for both Metric and SAE/Inch 3/8-drive socket sets. I purchased the following sets. When I bought, these were on sale for $12 per set. These sets are excellent because they come in molded plastic boxes and each comes with a ratchet. Metric Socket Set, Craftsman model# 34554. 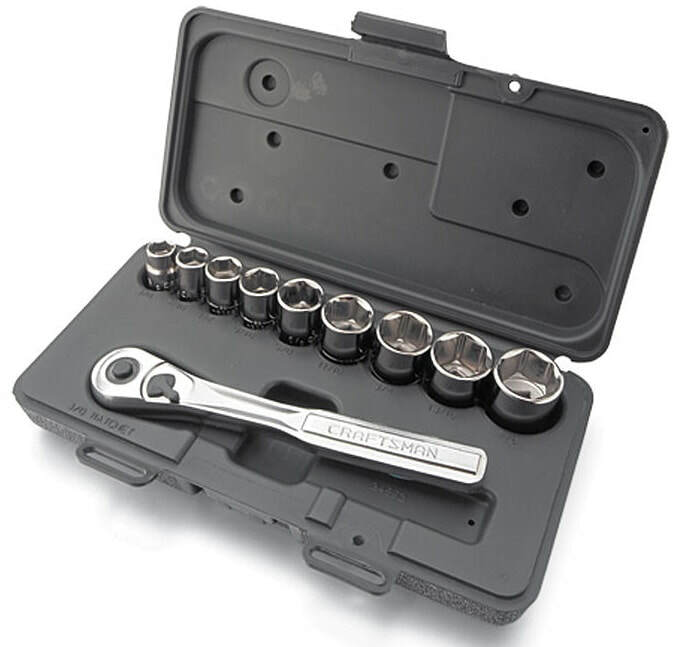 This set includes 9 sockets total of the following sizes: 10mm, 11mm, 12mm, 13mm, 14mm, 15mm, 16mm, 17mm and 18mm. It also includes a ratchet. SAE/Inch socket set, Craftsman model# 34553. 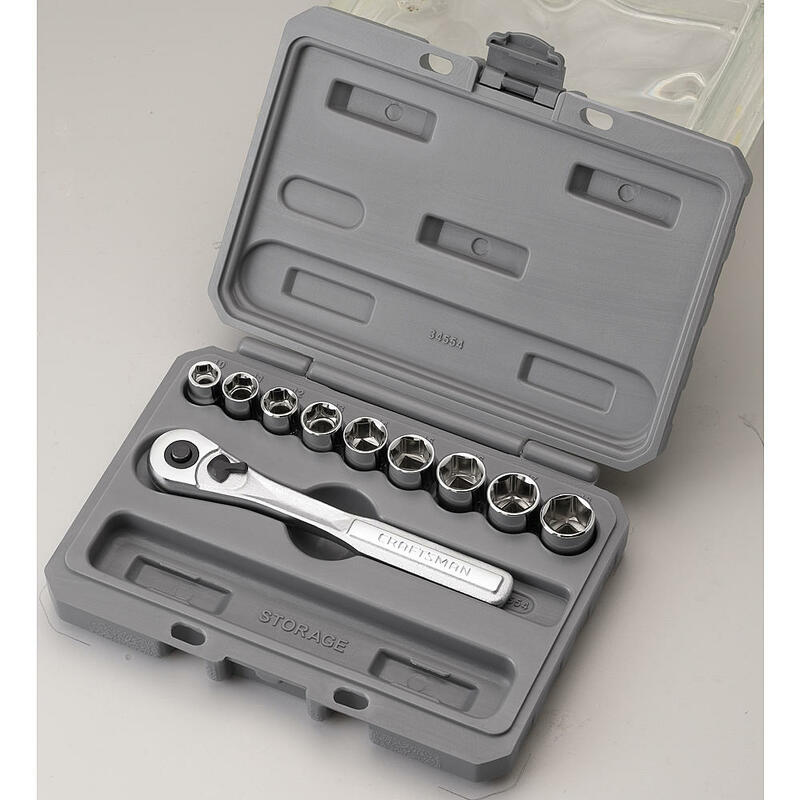 This set includes 9 sockets total of the following sizes: 5/16in, 3/8in, 7/16in, 1/2in, 5/8in, 9/16in, 3/4in, 11/16in and 7/8in. NOTE: The product description on the Sears website has an incorrect list of sockets. Also Note: Despite the picture, the case is actually the same as the Metric case but in black plastic. Therefore this case also includes the extra 'storage' compartment like the metric set case. I also wanted a selection of 3/8-drive extensions. Once again, Sears/Craftsman was the best deal. I picked up a 3-piece set (3", 6" and 10") for $8. 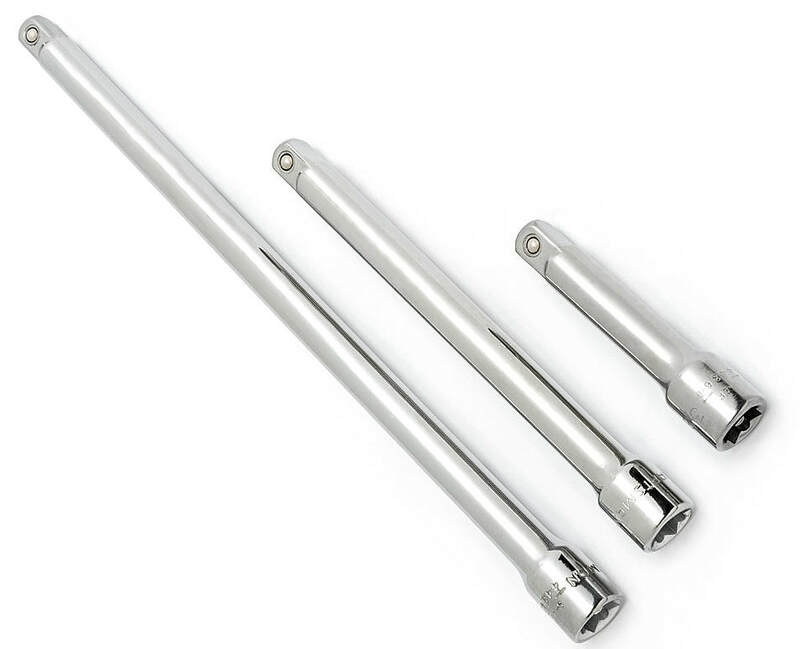 Lastly I wanted a 3/8-drive breaker bar. 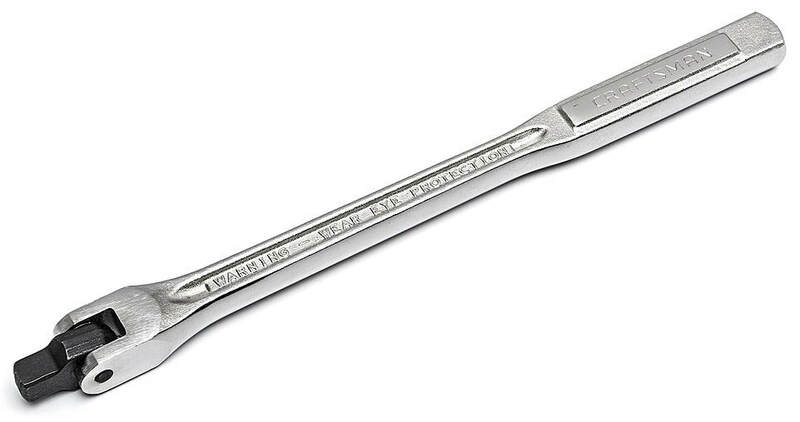 This is where I could have gone cheaper, but I don't really like the "tear-drop" style breaker bars that almost every other tool manufacturer offers. I really prefer the Craftsman "I-Beam" style breaker bar so I splurged a little and got one for $15. So my ratchet and socket tools cost me $47. Combine that with the $66 on wrenches and I'm at $113. So I'm prettymuch at my budget limit, but this just took care of the big cost tools. This is a catch all for any other tool I could reasonably think of needing in the yard. This includes screw drivers, pliers, channel locks, vise-grips and cable cutters. This is where Harbor Freight tools can do the job just fine. ​For screw drivers, I actually had a complete extra set of cheap no-name Phillips and Slot head screw drivers from a gift, so I put those in the kit. Cost to me $0, but for reference a 7-piece set of Pittsburgh screwdrivers should do just fine for $6. I wanted a pair of channel lock style pliers and I bought a set of 12-in v-jaw Doyle brand for $9. Vise grips are also handy to have so I purchased a pair of 10in curved jaw ($7) and 9in long nose ($8) Bremen brand. The last thing was a pair of cable cutters. These are handy for cutting heavy gauge battery cables or wiring harnesses. Again, these don't have to be fancy or high dollar, they just need to work. Pittsburgh 10in cable cutters cost me $7. So my miscellaneous hand tools cost me around $37, add this to my running total of $113 and you come out to $150. A little over my ideal "target" budget, but not bad for a well equipped kit. Some final closing thoughts and considerations. You are going to need some way of carrying your tools, this is entirely at user preference. Some people like to use old military surplus ammo cans. Others like a good old fashion red metal tool box. Others like a cloth or canvas tool bag or even a heavy duty back pack will work. For me, I had an old cheap tan cloth tool bag from Harbor Freight that wasn't being used so I'm using that. For additional tools, you might want to consider a good multi-tool. I have a SOG brand "Powerlock" multi-tool I bought from Wal-Mart many years ago that I keep in my bag. Mine is an older version of this current production tool. You would be surprised how often the saw tool comes in handy for cutting open plastic dashboard panels. For cutting rubber hoses and harness wire wrap/loom, you might want to consider a utility knife. Again, you don't have to go expensive here, a cheap handle with a sharp blade will get the job done. I personally like a folding style knife utility knife (Harbor Freight $6) but even a cheap retractable blade knife will work (Harbor Freight $2). If you are going after a lot of electrical parts, you might also want a multi-meter. I can offer two recommendations here. The first would be the great old standby Harbor freight multi-meter. These can often be had for free when buying something else so watch the sale ads. The other suggestion I can give if you are willing to spend a little bit of money would be a decent but still cheap auto-ranging multimeter I found on Amazon for $17. That pretty well covers it. Ultimately you will decide what you need in your toolkit but so far this has been working well for me.